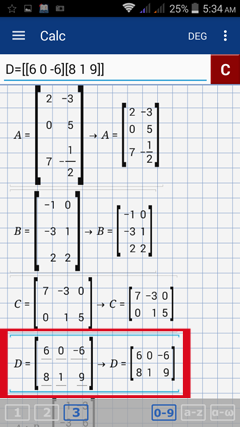 When performing operations on matrices, you can assign a variable to a matrix so that you do not have to rewrite the entire matrix each time it's used. 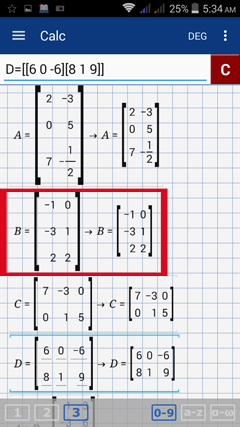 The variable assigned to it can be used as a shortcut. 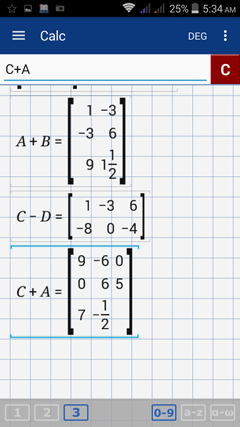 Enter each matrix using brackets to separate rows and a space to separate elements. To use open or closed brackets, tap the open or closed parentheses keys twice respectively. 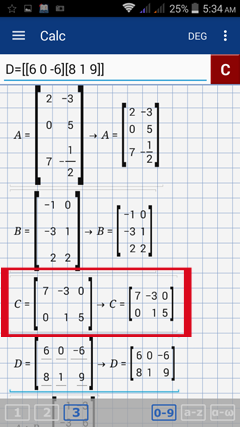 Given matrices A, B, C and D, carry out each indicated operation. Note: To enter any capital letter from A to F, hold its corresponding number key from 1 to 6. For example, hold the number 1 key to enter A, number 2 to enter B, number 3 to enter C and so on. You can also use the a-z keyboard. Hold "1" to enter "A"
Enter: A = [[2 -3][0 5][7 -1/2]]. Hit enter. Hold "2" to enter "B"
Enter: B = [[1 0][-3 1][2 2]]. Hit enter. Hold "3" to enter "C"
Type: C = [[7 -3 0][0 1 5]]. Hit enter. Tap the keys: hold 4, double tap (, double tap (, 6, space, 0, space, -, 6, double tap ), double tap (, 8, space, 1, space, 9, double tap ), double tap ). Hit the enter key. Type "A" by holding "1," "B" by holding "2," "C" by holding "3," and "D" by holding "4." 1) Type: A + B. Hit enter. 2) Type: C - D. Hit enter. 3) Type: C + A. Hit enter. 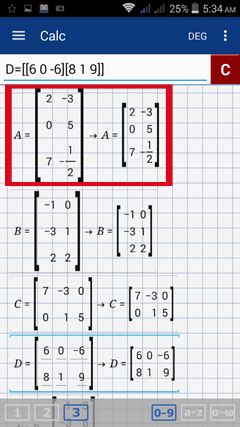 A reference to a row or elements of a particular matrix can be assigned using a 1-based index.